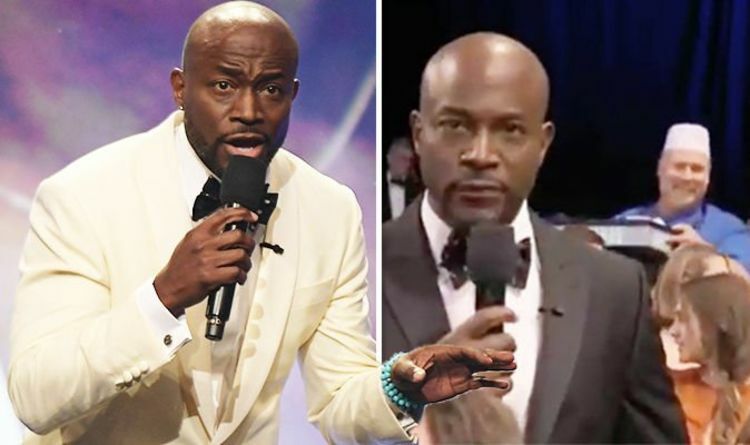 The Critic’s Choice Awards 2019 was held at Barker Hangar in Santa Monica, California and was hosted by Taye Diggs. Taye, 48, looked dapper in a black tuxedo and crisp white shirt for the night celebrating stars of film and television. However, the smartly dressed actor was upstaged by a vendor, who offered burgers to celebrity guests including Charlize Theron and Claire Foy. As the seller walked around handing out the fast food snack, Taye, who was stood in the audience, addressed viewers at home. When the movie star informed listeners of what was coming up next, the vendor flashed the camera a cheeky smile as he made his way through the crowd. Realising something was untoward, Taye span his head around to see what was going on behind him and spotted the gleeful salesman, who some viewers suspect was working for the food chain Joey’s burger. Grinning as he turned back around, the actor looked a little confused but remained professional and continued to present. But just as the All American star regained his form, the camera cut away baffling viewers watching at home. Earlier in the ceremony, Taye kicked off the show by saying he was happy to see more diversity in Hollywood and paid tribute to Black Panther. “It’s been another great year for movies and TV shows and not only was it an amazing year for creativity, it was also a great year for inclusivity of all underrepresented people,” he began. Speaking about African-American talent, he continued: “Black filmmakers earned a record $ 1.5 billion dollars at the domestic box office in 2018. Attempting to sing, Taye sang: “Let’s have a celebration about the representation of my brothers and my sisters in this year’s film presentation. Orange juice may get squeezed out of Canada's revised food guide ‘The Taliban Made Me Fight’: What to Do With Child Recruits After They Serve Time?